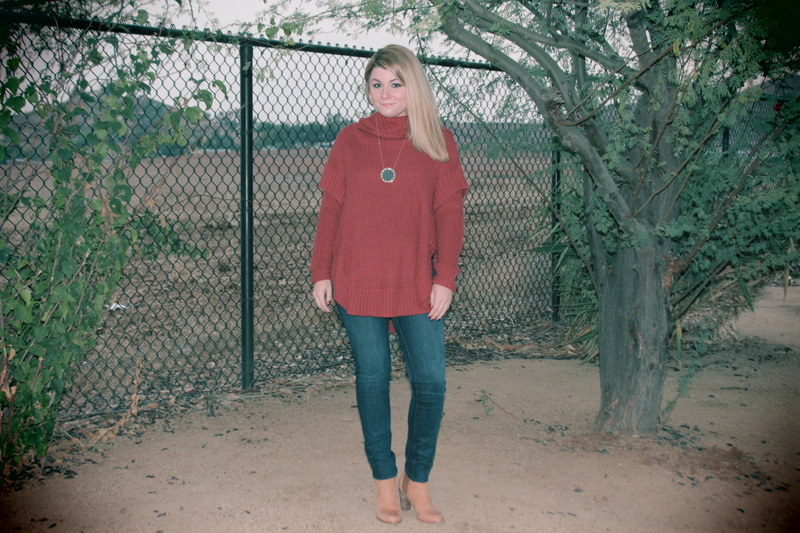 Chilly Weather Means Cozy Sweaters | Just Jess Fashion! Can you believe it was only a week ago that I was frolicking in 80 degree weather on the beach? To those of you whose winters consist of subzero temperatures, you’re probably going to read this and shake your head the whole time at my claim that this temperature is freezing. As a So Cal girl anything below 75 degrees and I begin to complain I’m in danger of dying of hypothermia. Crazy but I live in Southern California for a reason. I enjoy my sunny days. I’ve been enjoying my lightweight sweaters, but today I had to bust out the heavy knit because it was only about 60 degrees outside. It may have well been below subzero. This is the time of year you see us Cali folks bust out our puffer coats and Uggs. When the sun hides we dig deep for our winter wear. Today I opted for my favorite Fall/ Winter sweater! Tera cotta chunky sweater and brown boots make for a cute and cozy winter ensemble! Love this outfit Jess looks comfy and warm and I’m with you 60 degrees is entirely too cold!! Why would our family move to the snow??? The thought of living in the snow is beyond my california mind. When I leave the house at 4:45 and the temperature gauge in the car starts to beep as the temp drops and it says 26 or lower. I have my seat warmers on and the heater on full blast! Wow can’t deal with the cold!! Enjoy your winter and stay warm!! I love the color of the sweater and it looks wonderful on you. The necklace is so perfect. Wished my legs were as great as yours. I want those boots. I sure look like you are staying warm. I guess my SOCAL blood has gotten use to the cold weather. I like it, because I enjoy layering my clothes. I have a love of socks. The crazier the better. What are your go to socks? Brad found some great “warm” socks and they go really good with my work slacks. Sending you warm hugs.